Nice change of pace. I generally go out in person to any job our crews turn down due to difficulty. They’re good, but... Nowhere near the level of the guys at my last business. They give up too easily, and lack creativity. This particular job? 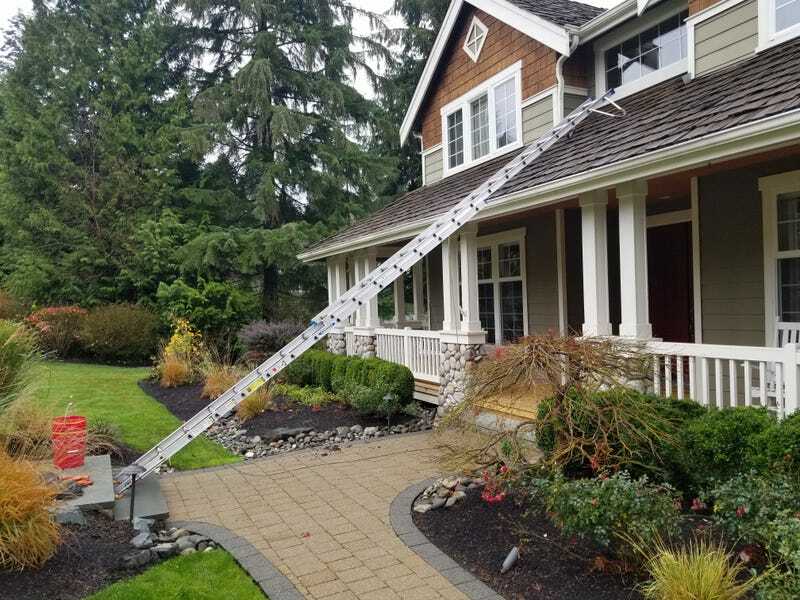 Clean out the gutters and whiten the exterior with bleach. They walked away because they couldn’t figure out a way to reach the second level gutters on the home. We have spiked shoes specifically for wood shingles, but yeah they’re still sketchy on steep shingles, especially in pouring rain. But... don’t just give up!!! You’ve got a large van full of tools.... There should be no situation where you can’t devise a way to get a job done. This attitude has been a huge problem the last month. So many jobs walked from. I really don’t get it. The crews earn commission, so if they don’t do the job, they make nothing. As a manager I don’t get the commission (grumble), but if I was the crew leader on the job and actually did it rather than walk away, I would have made $400 for myself in three hours. Who walks away from that?! I’m both irritated, and happy I got the chance to do some manual labor.